We're Not Some Faceless Corporation… You Deal Directly With The Owners. Louisville's ONLY Infinity Premier Partner. It Means We're Committed to TOTAL customer satisfaction. Our Warranties Have "Real Bite"—Not Loopholes. When We Say "Lifetime," We Absolutely Mean LIFETIME. Not Just "Perfect" Windows, We Have Doors To Match. Our Exclusive ProVia Doors Are Beautiful, Functional and GUARANTEED FOR LIFE. We Finally Found The World's Only PERFECT Window. Steel & GUARANTEED FOR LIFE. Affordable and Built For Life. We Never Use High Pressure Sales—We Educate You On Your Options… YOU DECIDE. We won’t sell you a window or door that we aren’t willing to stand behind, and we promise that if you ever have a problem with one of our products or services, we WILL answer your call and will do our very best to resolve whatever problem exists as quickly as possible. If we make a mistake, we will own up to it and do everything in our power to make it right so that you are 100% satisfied. In short: We promise to never dodge, avoid, or otherwise ignore your call if there is a problem. You call and you talk to the owners… PERIOD. Our Dedication And Commitment to 100% Customer Satisfaction is why Infinity from Marvin Hand-Picked Our Company To Be Louisville’s Premier Installing Retailer. We are a family-owned and -operated business that has lived, worked and played in Jefferson County for over 40 years. In those 40 years, we have seen a lot of windows and doors fail prematurely. In fact, we spent the majority of those years fixing and replacing other company’s products. It was literally a full-time job and our only focus. It killed us to know that people were spending their hard earned money buying windows and doors that we knew would just not last. We made it our mission to find something that worked; something we knew would last and allow us to sleep at night knowing we were doing the right thing for our customers. As a result, we’ve selected some of the most beautiful and enduring windows on the market to install for our customers throughout the Louisville area. Whether you’re after the incredible durability of fiberglass, the low-maintenance features of premium vinyl, or the charm of authentic wood windows, you can indulge your preferences with top-caliber products impeccably installed by the experts at Weber Windows. So if you're ready for a window that will last practically forever, looks amazing, and is guaranteed for life give us a call. You would be surprised at how affordable "perfection" really is. Another great choice for home replacement windows comes from ProVia, a leading manufacturer that has made a name for itself as a producer of award-winning energy-efficient windows and doors. ProVia offers homeowners a choice from among four lines of beautiful and enduring vinyl windows, including an option for real wood interior frames. Windows from this manufacturer are made to order in a wide variety of styles, so you can choose the ones that meet your priorities for aesthetic appearance, durability, and energy efficiency. 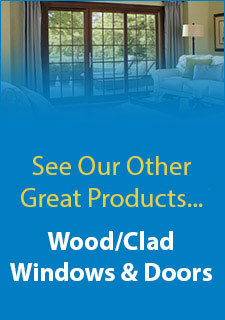 We also offer stylish wood-frame windows from JELD-WEN®. These windows hold all the charm of the wood-frame windows that many Kentucky residents have grown up with. But they’re crafted with special care to protect them from wood rot and termites. They’re also built with energy-efficient glazing techniques that will help them provide thermal protection for your home that rivals the energy efficiency of many synthetic windows on the market. No matter which of our top-caliber windows you choose, you’ll receive an expert installation by the highly trained and experienced professionals at Weber Windows. We’ll be happy to use our extensive knowledge of the window industry to help you choose the best replacement windows to protect and beautify your home in the Louisville area. Contact us today to get started. 1 Stiffness of the material to perform as designed. This stiffness is the flexural modulus of the material and is expressed in pounds per square inch. 2 Estimated savings are based on data set forth in the Window Selection Tool of the Efficient Windows Collaborative, available at http://www.efficientwindows.org. Actual savings will vary by product type, location, method of installation, individual home characteristics, local climates and conditions, utility rates, and other factors.